We created Eponicity. It unites Epona (Goddess of Horses), Infinity and Synchronicity. Symbolizing a truly authentic horse and human relationship. Eponaquest Equine Facilitated Learning methods encourage us to look within ourselves to find balance, regain strength, renew spirit and rediscover our power. Horses teach us to be authentic with ourselves and within our communities. The special horses at Leaves and Lizards will lead you to a place of peace and understanding. We offer multi-day workshops, riding treks and one day mini-workshops. Eponaquest principles are incorporated into all horseback riding activities offered at Leaves and Lizards. Eponaquest workshops are suitable for individuals, couples, corporate groups and families. Deborah Draves Legg and her husband Steve Legg left their life in the USA in 2006 and created Leaves and Lizards Arenal Volcano Retreat in Costa Rica. A 25 year career as a registered nurse prepared Deborah for the challenge of creating this healing retreat in Central America. Horses found their way into her life serendipitously after the move. In 2011, after reading Linda Kohanov’s book ‘The Tao of Equus”, Deborah contacted Kohanov’s Eponaquest headquarters in Arizona, in hopes of organizing a riding retreat. She had an immediate response from Shelley Rosenberg and Dr. Nancy Coyne, founders of the Eponaquest riding and psychotherapy program and My Horses, My Healers Sanctuary – and Eponicity, the Eponaquest EFL program in Costa Rica, was born. In 2015, Sally Nilsson made the move from corporate attorney in London to a new life in Costa Rica. As a certified professional coach and Eponaquest Riding Focused and Power of the Herd Instructor, Sally partners with Deborah in designing and facilitating Eponicity retreats. Eponaquest is a collective of experts exploring the transformative potential of horse-human relationships for development and healing. Founded in 1997 by leading author, Linda Kohanov, Eponaquest has received international attention for innovative programs engaging horses in the work of human development. Contact us for more information and workshop schedule. …… I must explain about the horses, because these are not your typical horses. Trained by outstanding professionals, they can perform as fancy “dancing” show horses one minute, and then turn around and race and run in a rodeo the next. But when you place a child on the back of one of these creatures, they are as perfectly mannered as a nervous mother could ever wish for. My mother told me when we boarded that airplane bound for Costa Rica that ‘this place will change you.’ … I brushed it off. She warned there was something, not exactly sure what, but something about the community, the air, the rain forest, the animals, that seeps into your soul and mixes it up a bit. For every person, the effect is slightly different. For most, it’s downright cathartic. I lost myself in the jungle and purged my soul. The Horses: The Costa Rican horses, Costarricense de Paso also known as Criollo, are a combination of several Spanish horses (Barb, Andalusian, Arab) and the Peruvian Stepping Horse. This magical combination has created horses with a smooth, comfortable gait. They are fearless, sure footed, hardworking and extremely versatile. The horses at Leaves and Lizards are cared for and trained using natural/relationship based horsemanship techniques. We use Dr. Cook’s Bitless Bridles. Options range from the highly spirited Criolla to low key Quarter Horses and anywhere in between. The riding style is Western. We will help you choose just the right horse. Maybe your horse will choose you! In Spanish it is called `Vinculo’ ; it is an explainable bond between two souls. 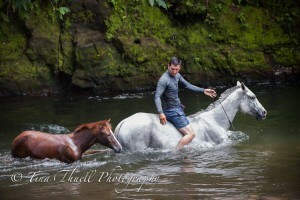 Join us in Costa Rica for the best horseback riding experience of your life! The Environment/Weather: Costa Rica has around 30 different micro-climates. Leaves and Lizards Retreat is located in the region of Humid Rain Forest. We are located on the Caribbean slope and our weather is wetter, the rain forest greener and denser than on the Pacific Slope. You may get wet on one or more of your riding days at anytime during the year. Temperatures are 80’s in the day and 70’s at night almost all year round. The Nature: You may feel like you have entered into the ‘Land of Oz’ during your journey. Our rides take you cantering across rolling hills, through rain forests, fording clear rivers, and trotting down isolated country roads through sleepy villages. Views from the hilltops are breathtaking. The Arenal Volcano dominates the vista, look the other way; you’ll see 3 more volcanoes in the distance and across the Northern plains Lake Nicaragua shimmers on the horizon. You’ll be sure to spot all sorts of creatures, including curious monkeys (without wings), happy sloths, dozens of species of flamboyant tropical birds, poison dart frogs and maybe even an ocelot or other wild cat-just to name a few! Your guides will teach you about the environment and how the flow of energy works in the complex circle of life in the rain forest. The Energy: There is something indescribable about the energy here. Some say it is a shift in consciousness. The real world slips away as you canter across rolling hills on forest edges. 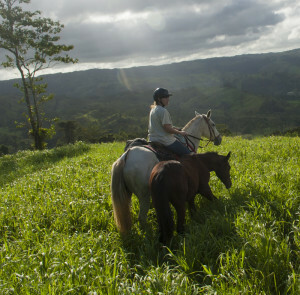 You find the Costa Rica motto, ‘Pura Vida’ (pure life) has a special meaning on the back of your horse. The Guides: Some rides include a bilingual naturalist guide and a local cowboy and horseman. Your guides will become fast friends and lifelong kindred spirits. They will offer you guidance and encouragement to improve your horsemanship skills and facilitate a Vinculo (special connection) with your equine companion. The Culture: The Costa Rican’s call themselves Tico’s. They are friendly, welcoming people who are proud of their country and are incredibility hospitable. Horses are a part of the culture and used for work on farms and ranches. Community events such as Rodeos, Topes (dancing horse parades), Cabalgatas (group cross-country rides) and Endurance Rally’s are yearly events in many communities. Experiencing the culture and people of Costa Rica is an important element of the Eponicity experience at Leaves and Lizards Arenal Volcano Cabin Retreat. 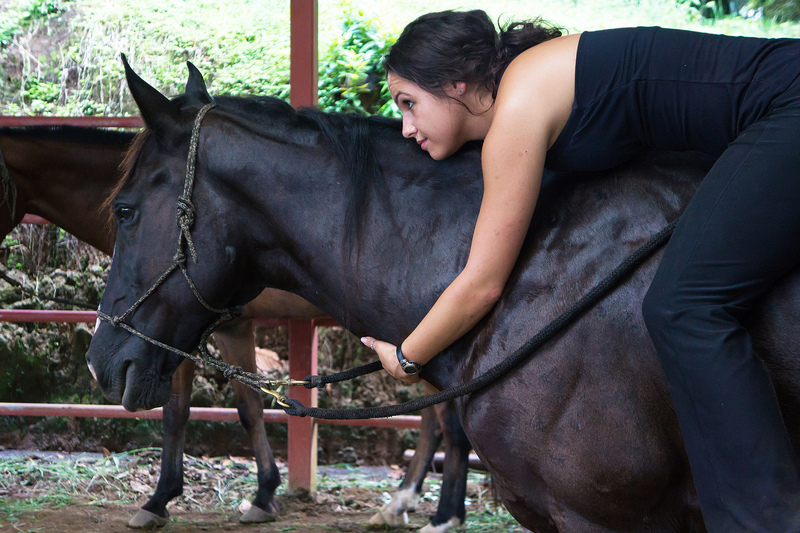 Due to the smaller stature of Costa Rica horses, in general, we have a 250 pound weight limit.